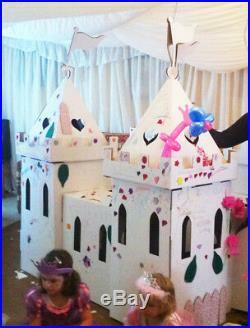 Build your own life-sized cardboard Princess Palace Playhouse Kit. Assembled size 164 x 164 x 185 cm (65" x 65" x 76). Fantastic paint and decoration activity, days of fun! Supplied in a sturdy storage box. Environmentally friendly 80% recycled cardboard & fully biodegradable. The Build, Paint & Play Princess Palace Playhouse Kit from Kid-Eco: A brilliant resource to encourage role play and stimulate imaginations! 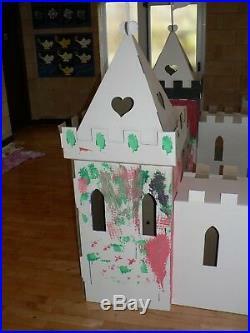 Complete with 4 castle turrets, roofs and 4 large castle walls with heart cut outs and flags. This Royal Palace Playhouse Kit truly is a blank canvas to stimulate for hours and hours of creative palace themed fun and role play. Supplied in a white, brown, pink, silver-grey or pink & silver matt finish it is made from eco-friendly recycled cardboard with profiled safety edges. It is fully biodegradable, re-useable and can be put back in its box for storage. The kit consists of 20 die-cut corrugated cardboard components that fasten together easily without the need for fixings or adhesive. No tools or special skill are required for construction, full assembly instructions are included. This product is suitable for all ages manufactured in the UK and conform to the 2009/48/EC safety of toys directive. Is primarily designed for indoor use but is suitable for outside use in dry and calm conditions. Our cardboard play houses are not suitable for children under 18 months. They are designed primarily for indoor use but are suitable for outside use in dry calm conditions. The cardboard play houses should be stored in a dry place. They should be kept away from fire or any naked flame. We recommend that adult supervision is provided at all times. These cardboard playhouses should be inspected regularly before, during and after use for any signs of damage which could cause potential injury. 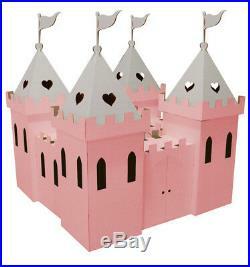 The item "Cardboard Princess Palace (pink & silver) Kid-Eco" is in sale since Wednesday, June 8, 2016. This item is in the category "Toys & Games\Outdoor Toys & Activities\Playhouses". The seller is "kideco-cardboard-toys" and is located in Grantham.